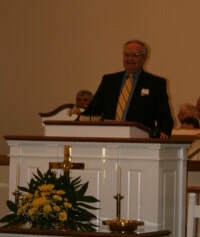 Senior Pastor ​Roger Lee Woodcock, Jr.
Lee Woodcock was born in Lynchburg, Virginia. He joined our staff in June 2017, serving as Director of Family Ministries & Outreach. His education includes a Bachelor of Science in Business Management from Liberty University and a Master of Arts in Christian Ministry: Discipleship & Church Ministry from Liberty Baptist Theological Seminary. Lee was ordained to the work of the gospel ministry by Hyland Heights Baptist Church in March 2017, and he is passionate about partnering with families to glorify God by making disciples. He and his wife, Taran have beem married since 2004 and he has three children: Laine, Noah, and Gibbs. In his spare time, Lee enjoys playing with his children, drinking coffee with Taran, eating ice cream, and writing. His favorite verse is Deuteronomy 6:6-7: “And these words that I command you today shall be on your heart. You shall teach them diligently to your children, and shall talk of them when you sit in your house, and when you walk by the way, and when you lie down, and when you rise.” Lee was called as our pastor on November 4, 2018. Our Deacons serve the practical needs of families within our church so that the body of Christ can flourish and grow. Each deacon at Oakland is nominated based on having Christlike character and a heart for people. ​Rick Thompson, our chairman of deacons has been a barber in our community for many years. He and his wife, Sandy have 2 adult children. Bucky Allin, our assstant chauirman of deacons is the elected sheriff of Prince George County. He and his wife, Leslie have 2 adult children and a granddaughter. Jimmy Browder and his wife Amy serve God by participating on various committees within the church and by helping others inside and outside the churh family. They have 3 daughters and a granddaughter. Music is a passion of theirs and they both participate on the praise team and choir. Vern Farkas is a contractor. He and his wife Gerrie have several children and grandchildren. Keith Frazier is employed by ACF Environmental in Richmond, VA. He and his wife Tammie have 2 adult children and 6 grandchildren. Keith's hobbies include reading, history, classic cars, antiques, camping and spending time with family and church members. Bob Jones is a retired patrol Sergeant for the Prince George County police department. He currently owns and operates Bob's Paint and Bodyworks. Married over 25 years to his wife, Jane Jones, he is blessed with four adult children and 11 grandchildren. Hugh Mumford is a semi retired public school administrator for Prince George County Public Schools. He and his wife Agnes of more than 54 years have three adult children, 10 grandchildren and 2 step grandchildren. Steve Skinner is employed as a production supervisor at WestRock. He and his wife, Jodi have 4 adult children and a granddaughter. ​Jerry Walters, is a licensed Social Worker who maintains a private practice in Hopewell. Jerry and his wife, Beverly have a son, a daughter and 3 granddaughters.